Salina sits on beautiful Lake Hudson, rated in 1994 as Oklahoma's number one Black Bass fishing lake, and the surrounding environment is lush with native plants, wildflowers, and trees. The dense deciduous forests prevalent in this region provide a safe and natural habitat for the abundance of wildlife that can still be found. The terrain is very hilly, and somewhat mountainous, and this vast expanse of land is considered to be a part of the foothills of the Ozark Mountains. Its natural beauty is spectacular and the Salina area truly lives up to the nickname of this region known as Green Country. 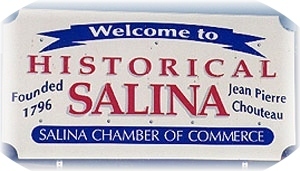 Salina was originally established as a trading post of Major Jean Pierre Chouteau in 1796 along the banks of the Grand River, which is now Lake Hudson.It is the oldest permanent American settlement in the state of Oklahoma. The name Salina was derived from saline, which came from the local salt wells in the vicinity. As a result of heavy fur trading between the Osage Indians and the new settlers from St. Louis, Missouri around 1802, Salina thrived and grew into a prosperous community frequented by many travellers. The trading post served as a general store for the rough territory. and, in recognition of Major Chouteau, Chouteau Day (a state holiday) is celebrated each year the Saturday on or before the 10th of October. The Stone Well House was built in the 1840's and is the oldest structure in the city and county. It was used as a water supply at the time for the Cherokee Indian Orphan Asylum. The Cherokee Indian Orphan Asylum was built in 1875 and was located where Salina's Old Gymnasium now stands.